Don’t you just love the feeling of being able to whip-up some elegant looking dish in less than 10 minutes and wow everyone around you and most of all yourself? 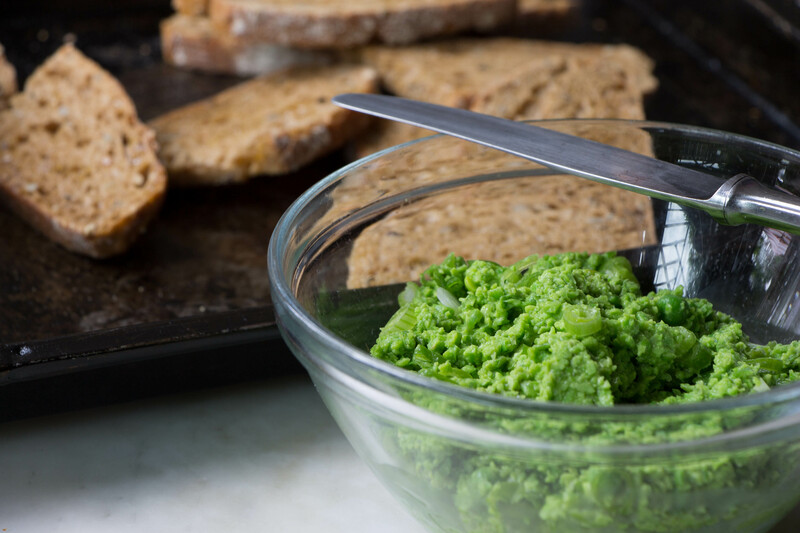 Well, this Green Pea Tapenade will do that for you! It has been a long and wonderfully hot weekend filled with activities. This hot weekend has really lent itself to light food with minimal cooking time and fresh tastes and colors. Stuff that you can just eat in the garden while drinking a glass of wine with friends or finishing that book which you only have time to read on the weekends. In our family’s case that would be food which lends itself to being made while major busyness is taking place around the house, like painting the house, helping out with homework, making summer plans, talking to your BFF for hours on the phone, grading papers etc….At about 11 today I thought of making this tapenade. I realized that I had almost finished a bag of raw fresh peas all on my own, since every time I passed by the refrigerator I would stick my hands in a bag filled with peas which I would greedily eat while doing something else. That is, eat the ones that wouldn’t fall on the floor to be eaten by the dog in the process of me putting them in my mouth while multi tasking and doing god knows what at the same time. I figured I’d better think of something to do with the rest of the peas to avoid getting extremely bloated by eating an excess of raw peas as well as to prepare something to eat that others beside myself could appreciate and enjoy. This recipe is very easy and can be eaten in a much more elegant way than I ate those raw peas while roaming around the house. 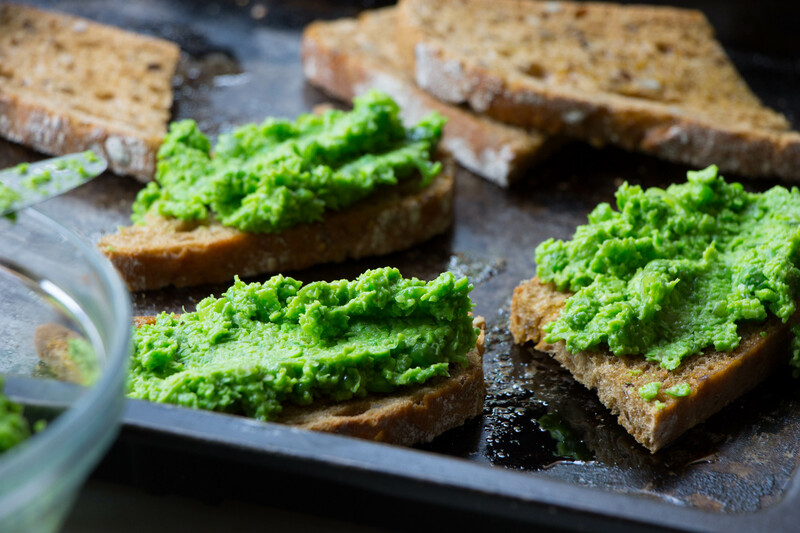 It can be used as a tapenade, on a sandwich, pizza or as a part of a salad platter and please accompany it with a glass of sparkling white wine! 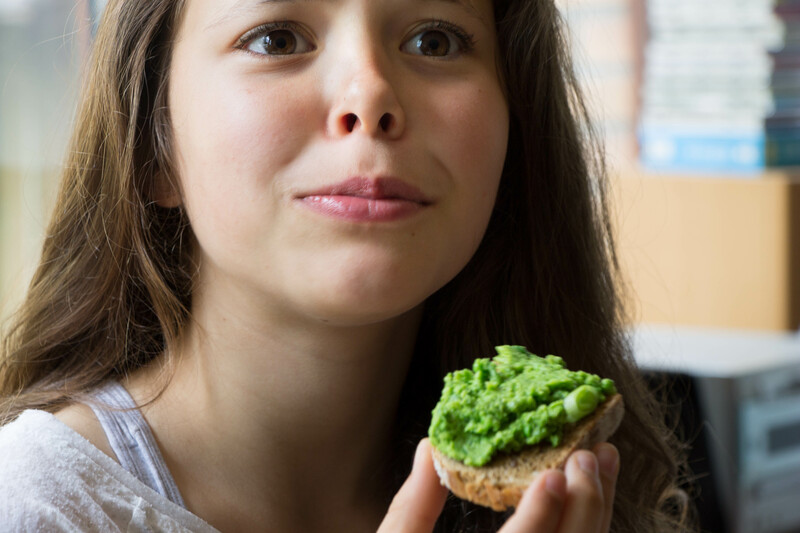 Feel free to use frozen peas if you don’t have fresh ones, although in that case you may get less of the nutty crispy taste and a more of a humus like texture. One of my kids is a ballet dancer and just like my other 3 children grew up on a vegetarian/macrobiotic diet. Today after a hard day of training and rehearsals for his end of the year performance, he came home a bit alarmed about a trainer’s comment regarding the dangers of consuming too much soy and the potential effect on his physical development, specially muscle building and his intake of female hormones. I know that soy can be controversial and that some people will have nothing to do with it. On the other hand I know that there are millions of people, including strong men, for whom soy is a basic source of protein and an important part of their traditional diets. The soy that we consume at our house is not genetically modified, we make our on soy milk and get the best quality tempeh, tofu, miso and tamari. Nevertheless I felt compelled to change our dinner menu a bit for his peace of mind. The Spinach Butternut Squash Pastries where originally supposed to be Spinach Tofu Pastries, but I must say that the butternut substitution worked beautifully, and I would definitely choose it the next time above the tofu version. We ate this delicious rolls with brown rice cooked in vegetable broth, kidney beans, braised tomatoes, braised cauliflower, a green salad and nori condiment. Will I eliminate soy from our diet? No, but I will re open my curiosity for the soy issue now that my 16 year old son has questions about it. What are the effects soy as a major source of protein on a growing ballet dancer. 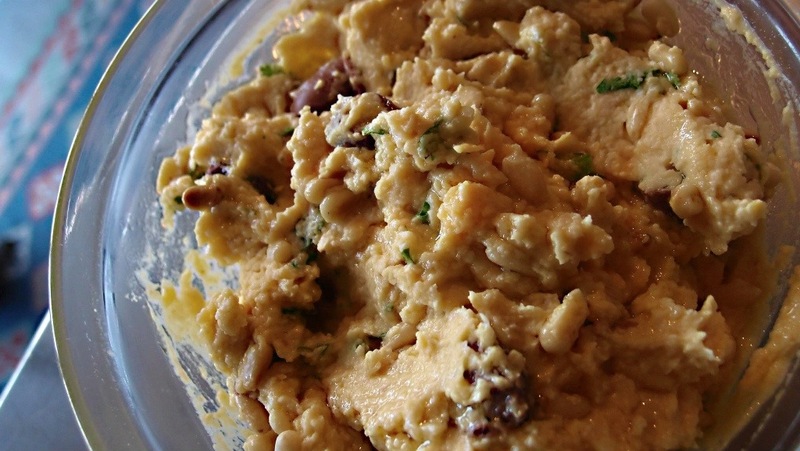 This humus is so easy and so tasty. I don’t use tahini or cumin because I like to keep it fresh tasting and those two ingredients are a bit heavier. 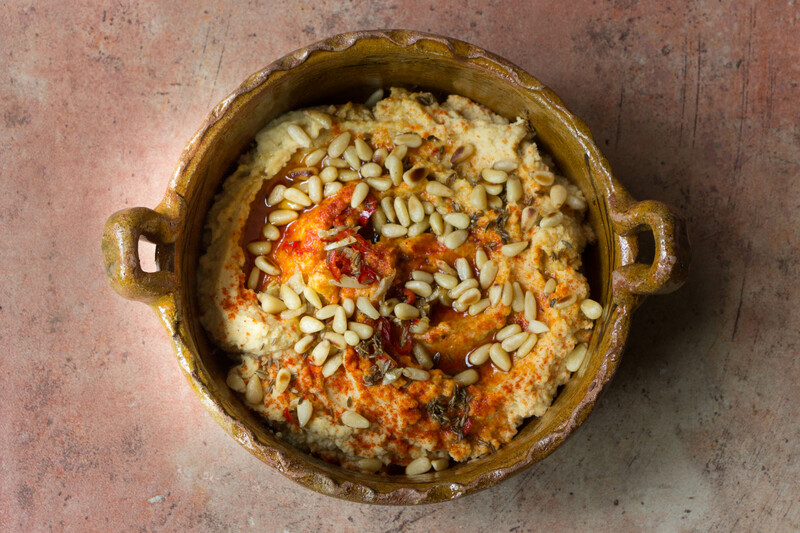 Make this humus when you have great olive oil around! 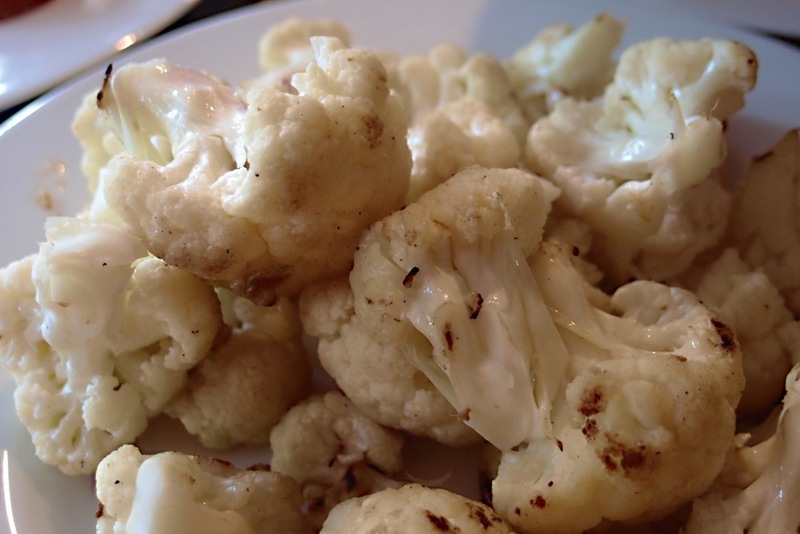 -garnish with the pine nuts and drizzle with extra olive oil, creating a film of oil on top of the humus. -cook the chickpeas with the water(I always put a small piece of kombu seaweed to speed up the cooking process). It takes about an hour to cook. 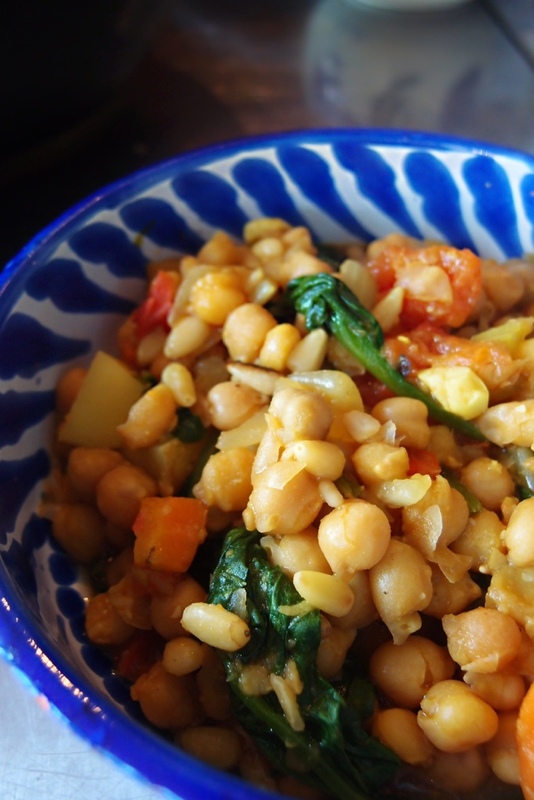 You can also pressure cook the chickpeas if you didn’t have time to soak them. In the pressure cooker it takes about 45 minutes to cook. -while the chickpeas are cooking cut your vegetables and find all your seasonings, to have everything close by and ready. -when the chickpeas are done let them sit while you sauté the vegetables. -in a stew pan warm up the olive oil and sauté the onions, then add the carrots, peppers, potatoes, garlic and tomatoes. Throw the veggies in one at the time, it creates an intenser taste. -sauté for a bit, stirring. -add 1/2 tsp. smoked paprika and a tiny bit of turmeric and 1/2 tsp. cumin, stir. -add the sherry or wine, and then the chickpeas with a bit of the cooking liquid if you have some and add sea salt to taste. – let it cook covered at medium heat for about 15 minutes, checking occasionally. -add a bit of water if it’s too dry, and cook until the stew thickens. 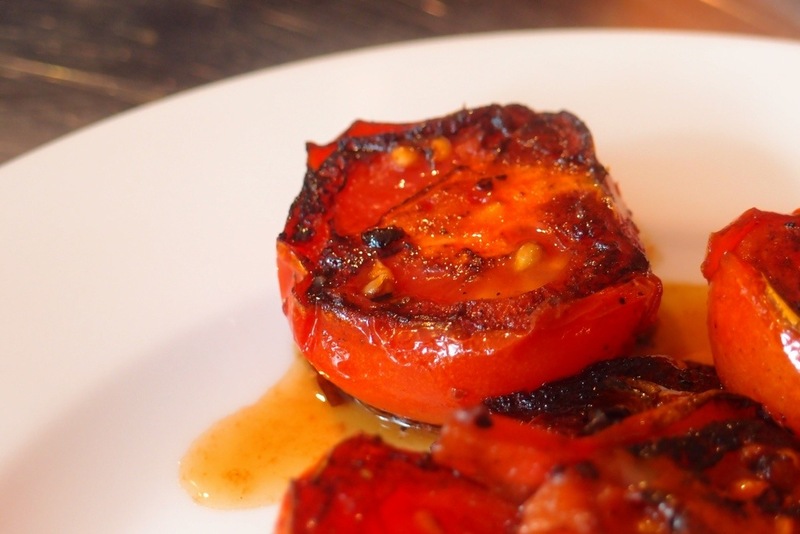 -add a tbs of balsamic vinegar and sprinkle garlic powder generously. 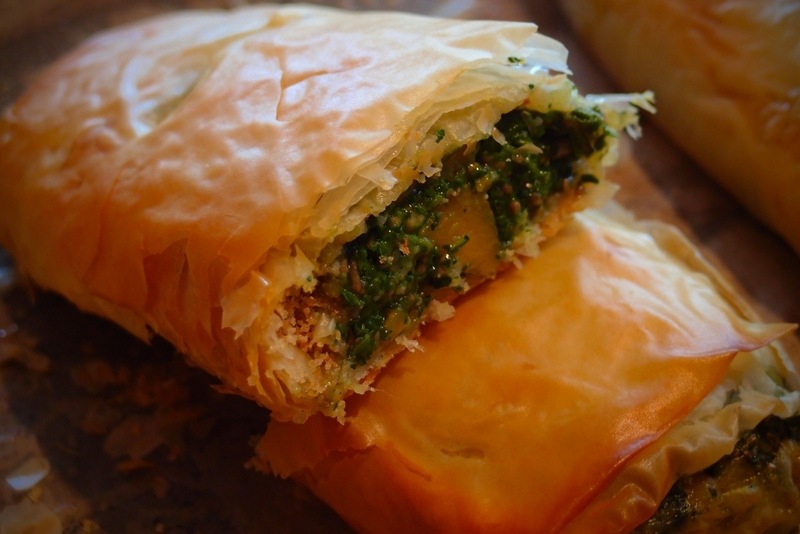 -cook for another minute, turn off the fire and add the spinach and the roasted pine nuts. This beautiful combination of Flamenco and Salsa(Bebo & Cigala, Lagrimas Negras) is a reflexion of my heritage, and maybe it will inspire you to add some extra spice to your black beans, it does for me! It’s fantastic music, and will liven up any party. This black velvety soup has a very sensual and comforting quality to it, the slightly bitter sweet touch of the black beans combined with the tangy tomatoes, smoky chipotle accent and the cilantro garnish gives the dish an exotic down to earth naughtiness. -let the soup cook for 20-30 minutes at low fire. When I was a kid in Cuba I loved listening to my mom tell me stories about her own childhood. One story I particularly remember was about a time when my mother had been quite sick. She had a long recovery period, in which the doctor had advised her to eat very well in order to gain her strength back and continue to grow. At that time my mother didn’t have a good appetite as a result of her illness, and her parents didn’t know what else to do to get her to eat better. Her godmother or “madrina” suggested that she went to spend sometime in the countryside with her, and promised my grandmother that she would have my mother eating in no time. This woman was older and had no children, she had time to spend creating dishes that would please a fussy child like my mom. The godmother was also fussy herself and very neat. The story goes that for the godmother to make sure that her house was clean she would have my mom go outside the house lay on the floor across the street and look inside her house from a laying position to make sure that there were no difficult to see particles of dust, and that her floor was impeccably shiny and clean. In spite of her madrina’s obsessive behaviour my mom had a great time during her extended visit. 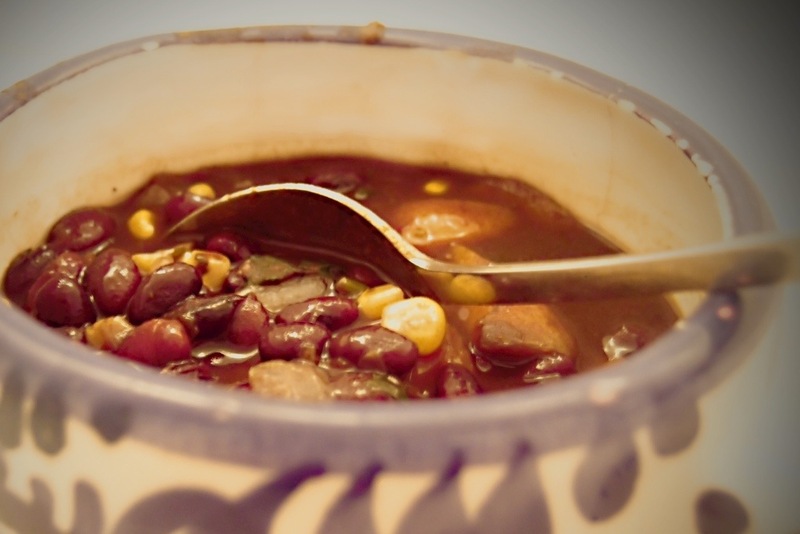 My mom remembers her godmother making black bean soup with a special touch to make it irresistible to her. Her godmother would decorate the soup by making a circle of “platanos maduros fritos” or fried plantains around the edge of the plate. As a child I really loved this story and this dish. To me this soup is comfort food at its best. 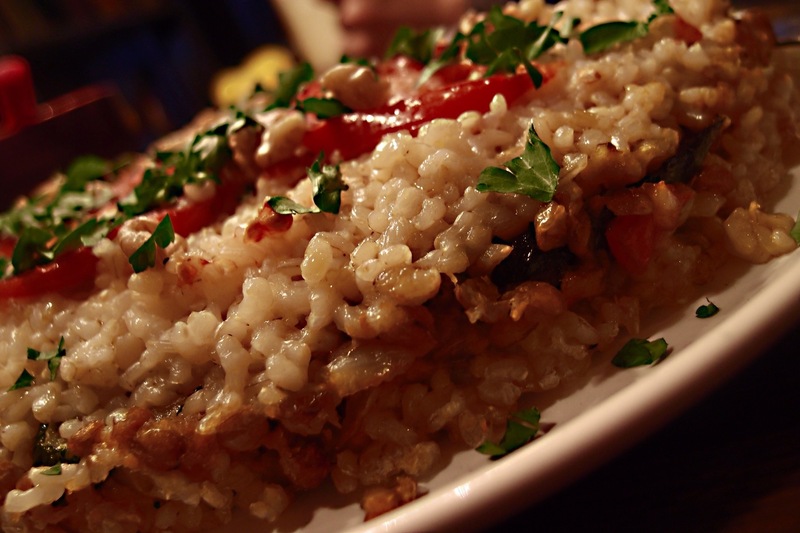 Maqluba is a Palestinian upside-down rice dish, traditionally filled with meat and vegetables. This is not a traditional Maqluba, but I liked the idea of layering rice with vegetables and lentils, mostly to pimp-up the presentation, and give it a “special” touch. Here I have made it really simple, but you can imagine how you could layer it sky high, (if you have a suitable pan) use all sorts of fillings and get more adventurous with spices, if you like. My 11 year old daughter just came back from a three day school camp, she is totally wiped out, so I wanted to make something wholesome, not too rich, but a bit special and I figured that the presentation in this dish could work Unfortunately she has been sleeping deeply since she got back and doesn’t seem to be planning to wake until tomorrow, this mild Maqluba could make a nice breakfast though. Today I really had no time to let my cooking imagination wonder. I am involved in a series of projects which don’t have anything to do with cooking and require a lot of my time. Nevertheless the kids have to eat, and the blogger has to blog! Yesterday while laying leisurely on the park during our picnic, I enjoyed reading bits of a fantastic book I’ve had around for a couple of years but never really bothered to read: “The Lost Art of Real Cooking“, by Ken Albala and Rosanna Nafziger. I really recommend it! Well, the book really helped me today to cook with some dignity and confidence even though I had few ingredients and little time. If you read the book you’ll know what I mean! The dish I am about to describe is not a miracle or a new idea, but for some reason I felt really “together” and even creative while making it, and the eaters liked it.